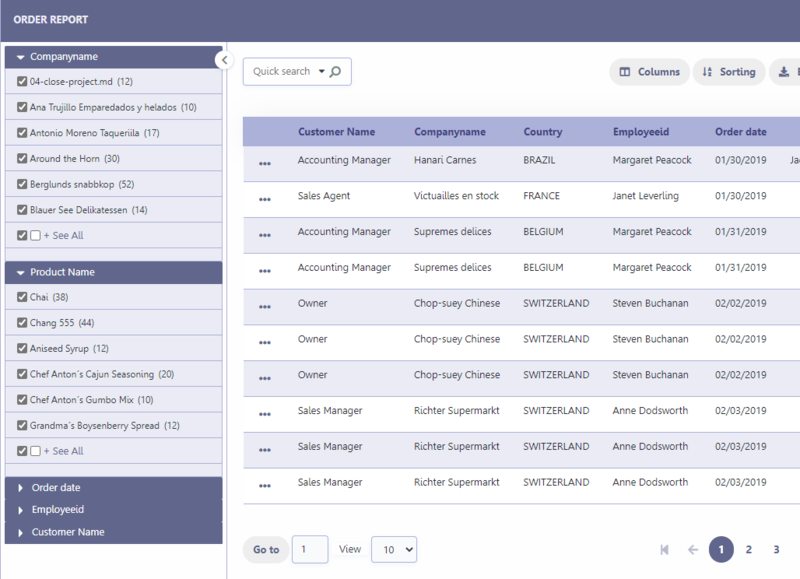 The refined search is a feature where you can integrate a search interface, next to the Grid, limiting values according to a universe that exists in the connected database. Move searched above : When you filter by a field, this field will be moved to the top of the refined search stack. Start mode : This option sets whether the fields select options will start open or closed. Minimum width : This option sets the minimum width for the refined search fields, value in pixels. Maximum width : This option sets the maximum width for the refined search fields, value in pixels. Minimum height : This option sets the minimum height for the refined search fields results, value in pixels. Maximum height : This option sets the maximum height for the refined search fields results, value in pixels. The refined search is automatically added to the Grid application when one or more Grid fields are selected in the tab “select fields”. In the tab “Edit fields”, you can configure each field according to what you need to display within the application. Fields : Listing of selected fields in the tab “select fields”. Range : This option activate a slider with intervals between the smallest and largest value. Increment : When using the range this option will set an integer value to increase the range. Show value : When checked, displays the range values in the slider. Multi select : Enables multiple selection values to perform the filter. Start opened : This option sets the initial mode for fields selection display in refined search. Quantity : This option sets the initial amount of records to be displayed for each field selected. Date : This option sets the date format that is displayed in the date fields inside the filter. Message for empty fields : This option sets a message to be displayed when the field has empty values. You can also use a variable from Scriptcase language system.